Mango seed weevil | Infonet Biovision Home. It feeds on mango leaves, tender shoots or flower buds. 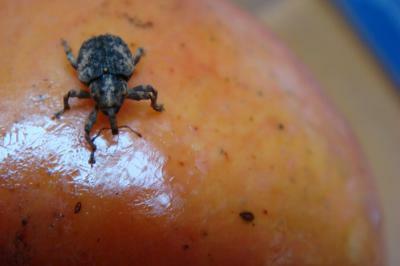 Female weevils lay one egg on the young fruit leaving a small, dark mark on the fruit skin. The larvae burrow through the flesh into the seed and destroy it. 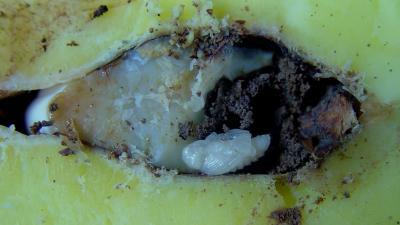 The larva develops and grows in the mango seed. 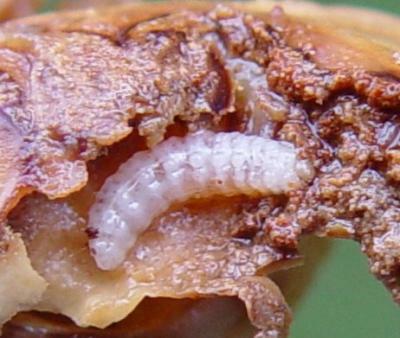 When the larva has grown up to an adult beetle, it tunnels through the flesh and leaves a hole in the fruit skin. The tunnel gets hard and the fruit cannot be sold anymore. Keep the orchards clean of all fallen fruit and plant material by collecting, burying or burning it. Sticky bands applied at the upper end of the trunk before it branches has been recommended to prevent weevils from migrating to branches for egg laying. However, there are some reports that, although these weevils are not strong flyers, they can fly, and could infest the trees in spite of the banding. A method for banding is described in detail under citrus trees/ants control. Scout fruit regularly and remove fruits with egg-laying marks and destroy weevils (larvae, pupa and adults) in mango seeds (stones).